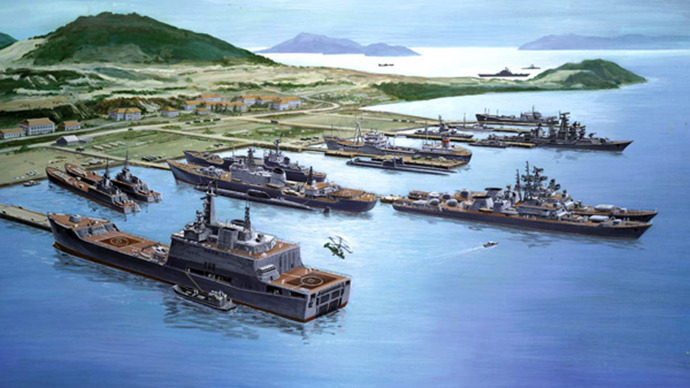 Artist’s concept of ships in port at Cam Ranh Bay, Vietnam. Vietnam will get its own submarine fleet as soon as this year, said Russia’s defense minister while on a visit to Hanoi. “This year a new page will be opened in the history of the Vietnamese Navy – it will get a fleet of submarines,” Sergey Shoigu told reporters following the meeting with the Vietnamese Defense Minister Phung Quang Thanh. The Russian minister said that they reached an agreement on synchronization in preparing both the submarines and their crews, and also decided that Russian military schools would train more Vietnamese specialists in the nearest future. In earlier comments Shoigu called the cooperation with Vietnam one of the priorities of Russia’s foreign policy and promised that Moscow would renew active military cooperation with Hanoi. In particular, the two sides discussed the possibility for Russian specialists to use the naval base and the military airport in Cam Rahn. All talks were held in secrecy, but Shoigu’s visit to Vietnam started from a trip to Cam Rahn, which was once used by Soviet and then by the Russian Navy, but was abandoned in 2002 due to lack of funds. Russian experts are divided on the possibility and necessity of putting Russian military bases in Vietnam. Colonel-General Leonid Ivashov, former head of the foreign cooperation department of the Russian Defense Ministry, told the Nezavisimaya Gazeta daily that such a step is simply necessary as it would seriously strengthen Russia’s positions in the South East Asia. At the same time, the Interfax news agency quoted an unnamed source in the Russian Navy HQ as saying that the return of the Cam Rahn base is not necessary and the issue is not even on the agenda. News of Russia’s future role in the beefing up of the Vietnamese navy comes on the background of the major international row over the South China Sea and its major oil and gas deposits. In the latest developments, Vietnam has commenced exploratory drilling on the sea shelf, but China replied with a note demanding it to stop. Soon after that China declared that the oil under the South China Sea was its national asset. Other neighboring countries, such as the Philippines and Malaysia also voiced claims to the resource-rich region. This entry was posted in The world's submarines and tagged Russia, Vietnam on March 8, 2013 by jasonlockley.